Some of these logo positions may not be available in this store. All embroidery locations on apparel not available on all items. For multiple logos, personalization, large volumes or any other customization not available online, please call customer service, (888) 839-7366. Pure perfection—in a v-neck, Unlike other tees, Perfect Weight tees remain looking and feeling perfect wear after wear, 4.3-ounce, 100% ring spun combed cotton. Embroidered Logo. 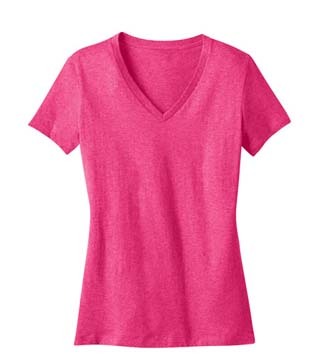 Please select the Font, and Location of your personalization for Ladies' Perfect Weight V-Neck Tee. If you choose a location where a logo has been selected, the personalization will be centered under the logo.